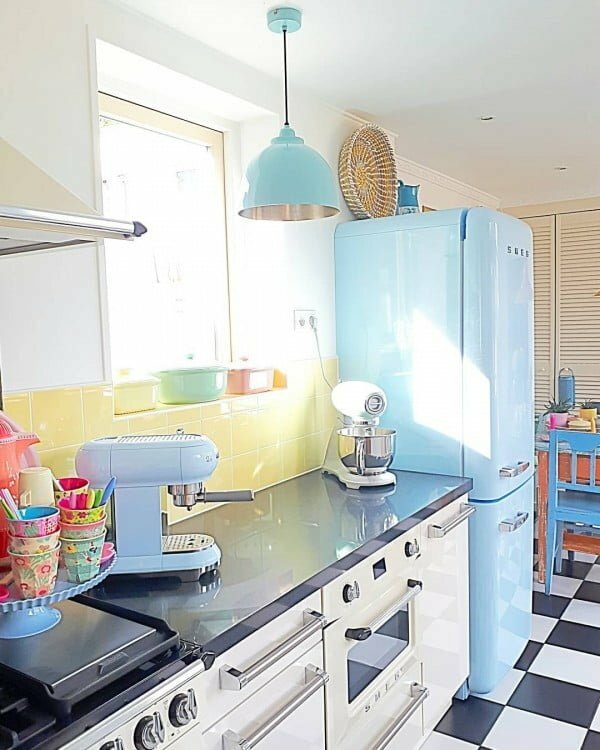 Want to turn a drab kitchen into a fab and unique retro kitchen? Here are 30 brilliant ideas on how to embrace the style even on a budget. Modern kitchen design can be quite mundane with monotonic colors, plain colors which are usually very neutral with clear-cut sharp edges. 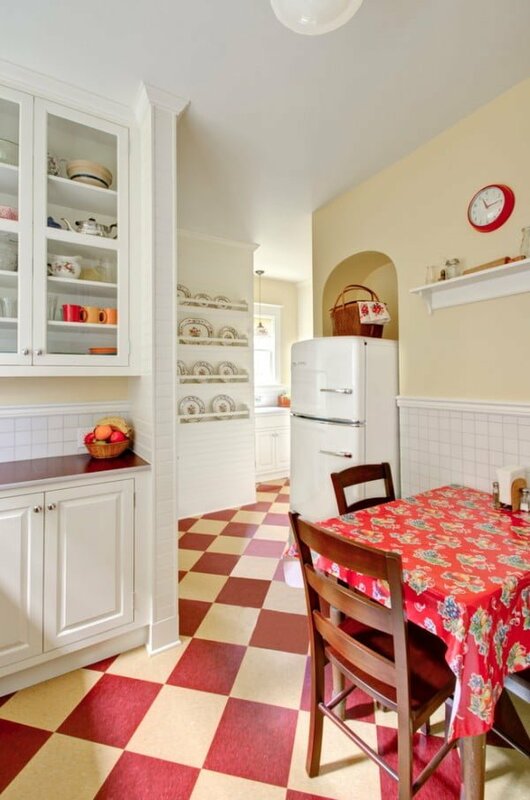 As a complete contrast half a century old kitchen design had a vibrant, joyful quality to it. Today we bring that quality back to our kitchen with a retro-inspired design. 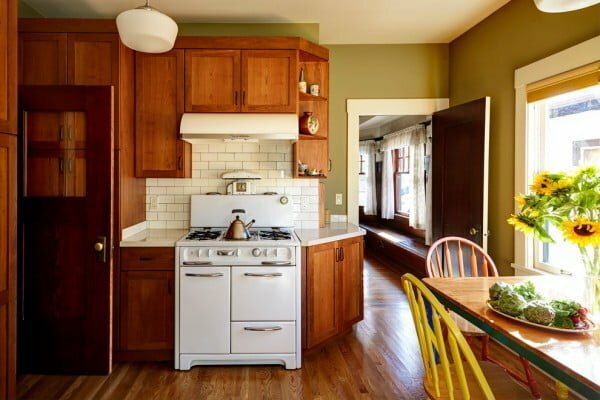 What makes retro kitchen design are the dominant pastels, popping bright colors (dominant red, blue and green shades), checkered floors, wallpapers, rounded corners and a lot of detail. You can call this design style anything but boring. 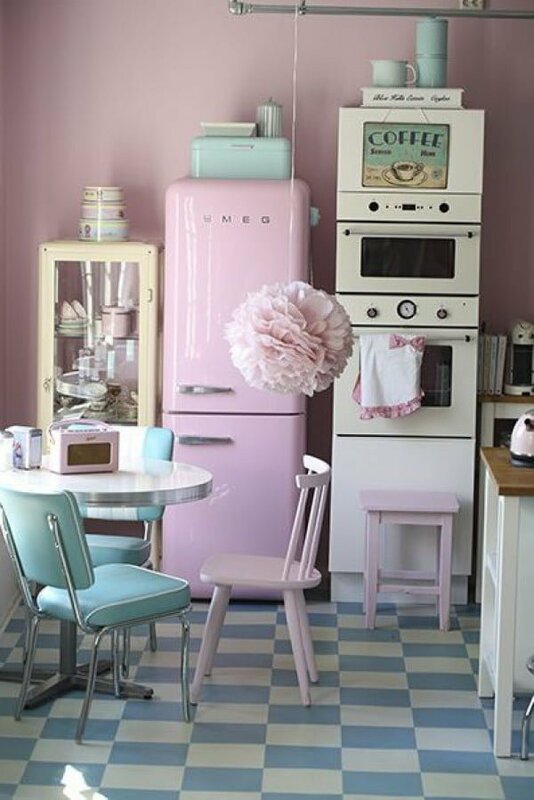 And here are 30 ideas to inspire you to try the retro style in your kitchen decor. 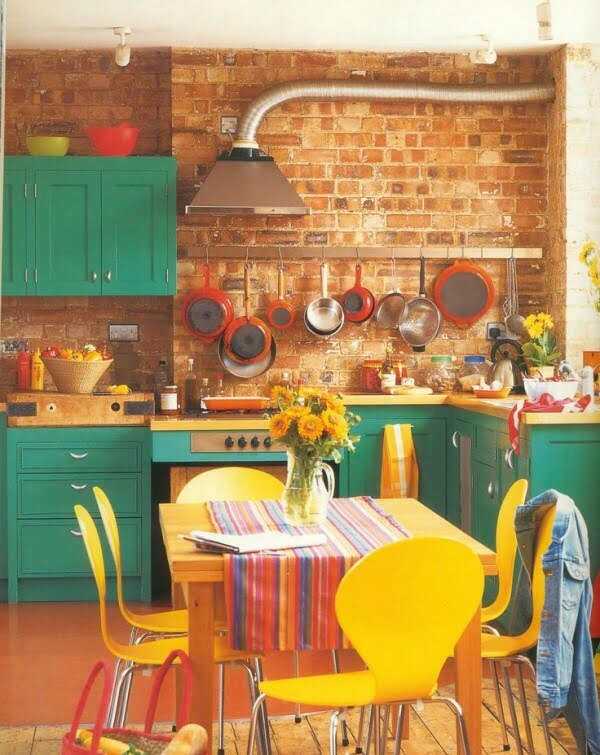 Vibrant colors are typical to retro designs, and we can find this style in this kitchen. From orange walls to checker tiles, the interior is bursting with color. 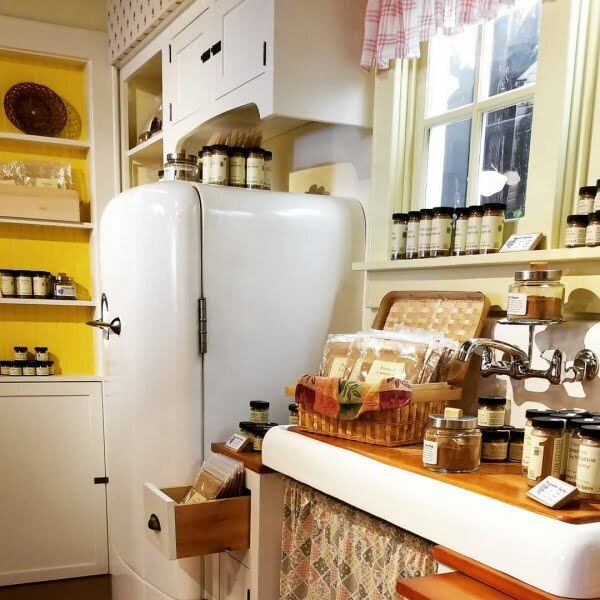 The vintage appliances and shaker cabinets with beautiful embellishments only bake it better. Red is the accent color in this kitchen design, and we love it. It all starts with the red tile checker floor. The accents are then sprinkled across space. And it all comes together as a fantastic retro kitchen. The fridge can easily be the focal point of the kitchen as it is one of the most prominent parts. 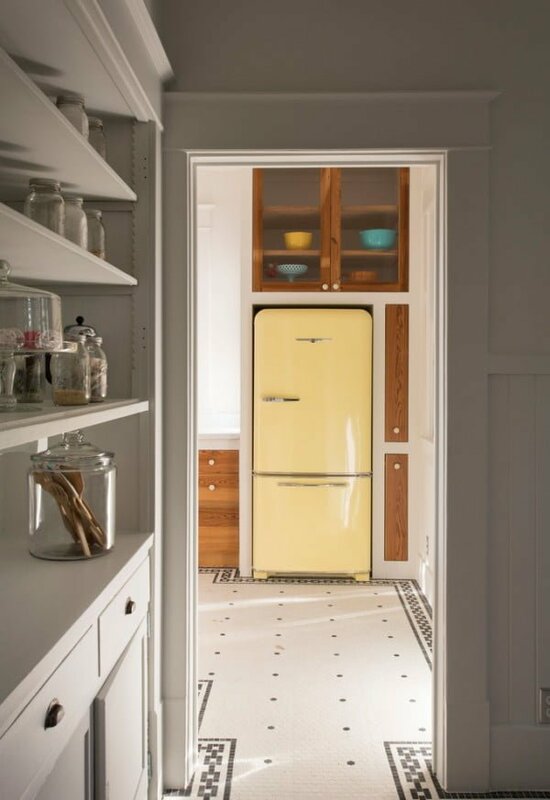 In this case, a beautiful vintage fridge in pastel yellow helps create a retro vibe in this design. It shows how little it takes to create such a beautiful retro design. 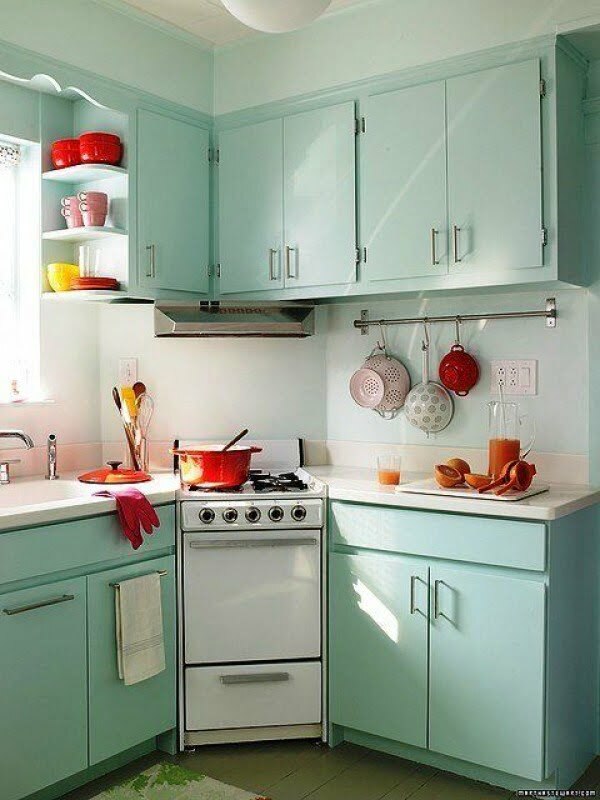 Green is another favorite color for retro kitchen designs. 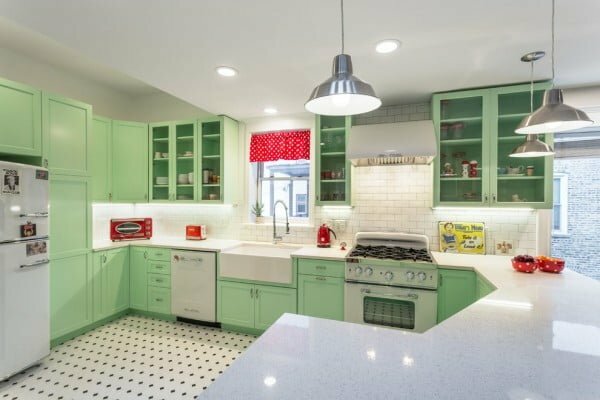 The green kitchen cabinets in the shaker style make a beautiful design that embraces retro. The red accents are subtle but help achieve that pop. It all comes together nicely with the subway tile in the background and mosaic floor tile. 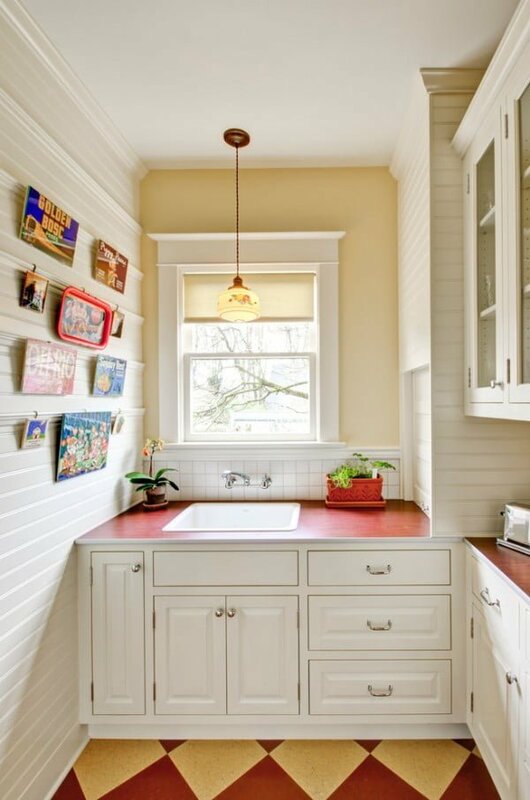 Forty-five degrees of charm is what you get in this cozy retro kitchen nook. Modern cabinets perfectly accent the restored wood floors. The perfect blend of past and present makes for a great future. There’s retro, and then there’s rustic retro. 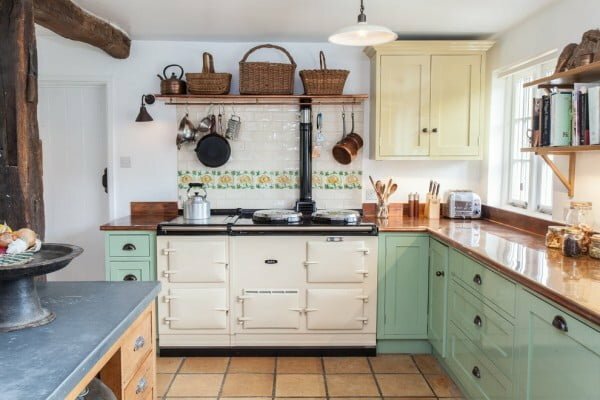 Here is a lovingly and perfectly restored example of the rustic look. Very clean and utilitarian. The only thing missing is an apron hanging on the door. 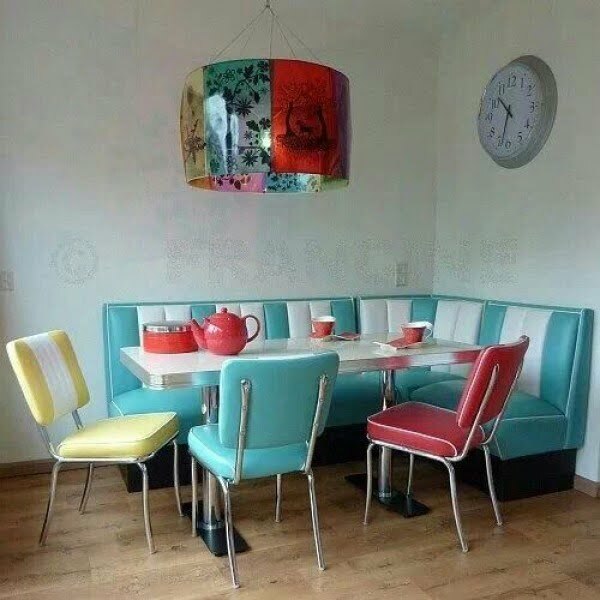 Retro isn’t always about the appliances but the look. It is entirely possible to go this style and still use modern fixtures, cabinetry, and other materials without compromising the intent of the project. In this case, it’s all in the choice of color and beautiful metal posters on the walls. 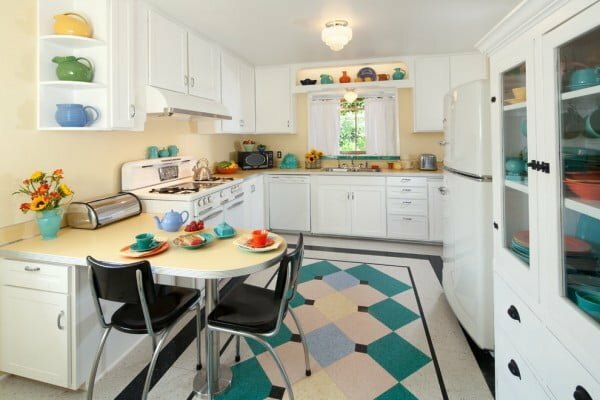 Here’s a full-on California retro kitchen complete with an island for serving or intimate meals in the kitchen. 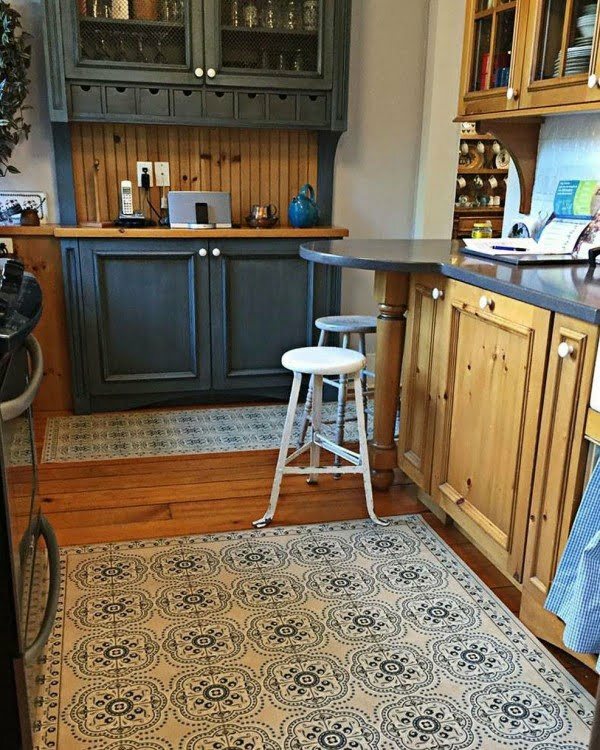 Bold southwestern colors pop when placed against the traditional white background of appliances and cabinets. Pastel items against the stark white background are obviously on trend these days. This pert little kitchen from the Netherlands serves as a perfect illustration of the universality of the concept. 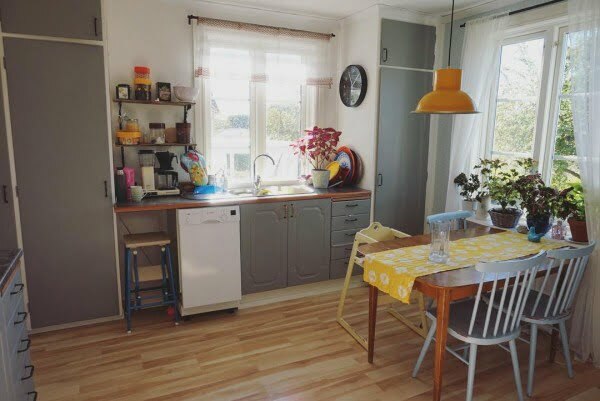 Conversely, this neutral-toned kitchen from Sweden shows what can be accomplished against an all-white background without going with bright and sunny colors. A more demure statement but very eye-catching. In this charming inversion of the white background theme, the backdrop is all done in varying shades of yellow, which makes the remaining pieces, all done in white, pop to the forefront as opposed to being relegated to the framing of the image. As time goes by, the concept of retro advances through the years. In this case, retro is not 1960 but 1980. Even that era is now getting to be a lifetime ago for many people. The main difference is the generous use of patterns instead of color. The 40s are calling. In this case, it’s the 1840s, replete with charming display cabinets, glowing wood floors, and many examples of exquisite wood craftsmanship to lend additional style to a utilitarian space. Yes, grey can be retro. Here’s an interesting contrast between the grey and white theme of the room as contrasted against the light blonde flooring. The use of sheers on the windows lends a light, sunny day feel to the effect. You could practically open your roadside diner with this set-up. Immaculate look with prominent chrome accents, coupled with an excellently contrasted theme of muted mint green and bright Christmas red. Can retro be modern? It certainly feels like it in this kitchen. 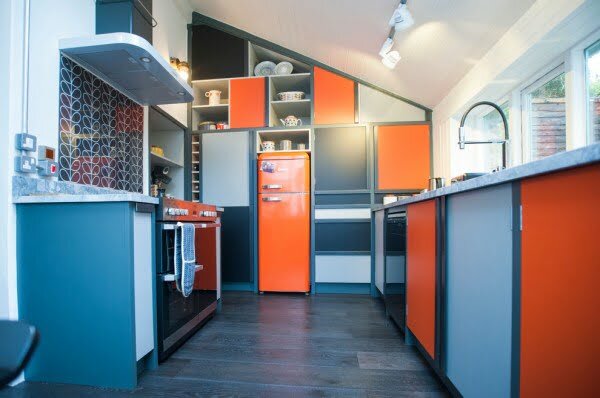 It’s a fascinating effort that gives one the impression that this is a simple 50s style kitchen jazzed up with Mod-look geometrics and colors. Capital use of available space for lots of storage. 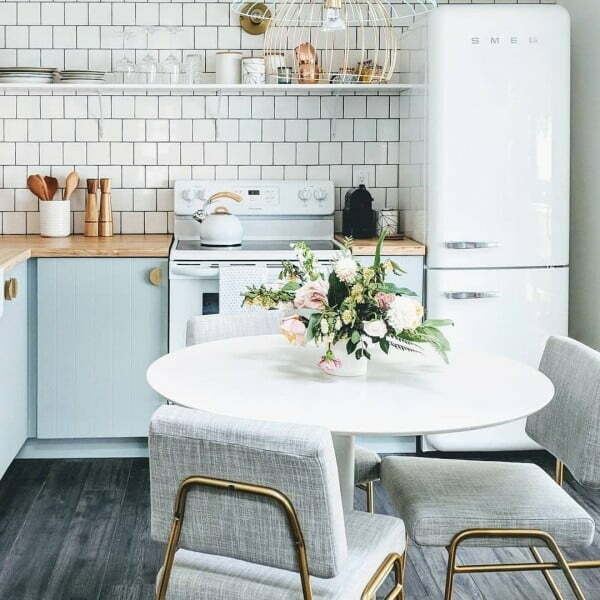 This simple little kitchen gains maximum charm from its tasteful pairing of robin’s egg blue appliances and bright yellow tile as framing for them. Very warm and cozy feeling. 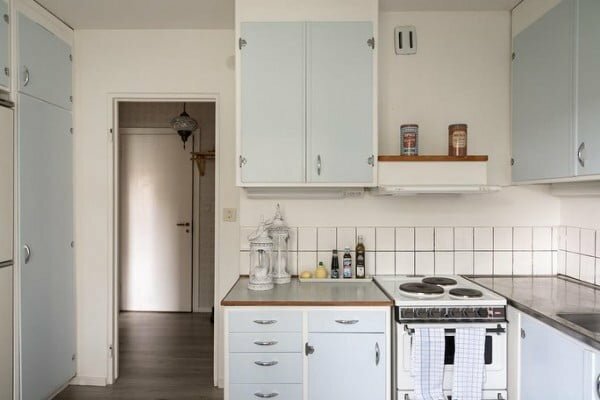 Spartan styling from the early 60s relies upon the little things, such as cupboard door handles, to make its statements against the otherwise overwhelmingly white backdrop. Little splashes do make great waves. 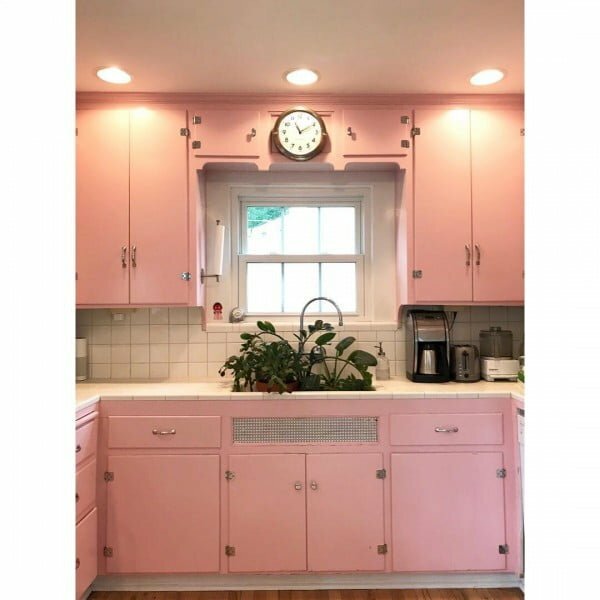 This kitchen is aimed squarely at the heart of the retro era and lands a big punch with its authentic chrome hinges and pink-and-white color scheme. The under sink grillwork is a uniquely authentic touch. 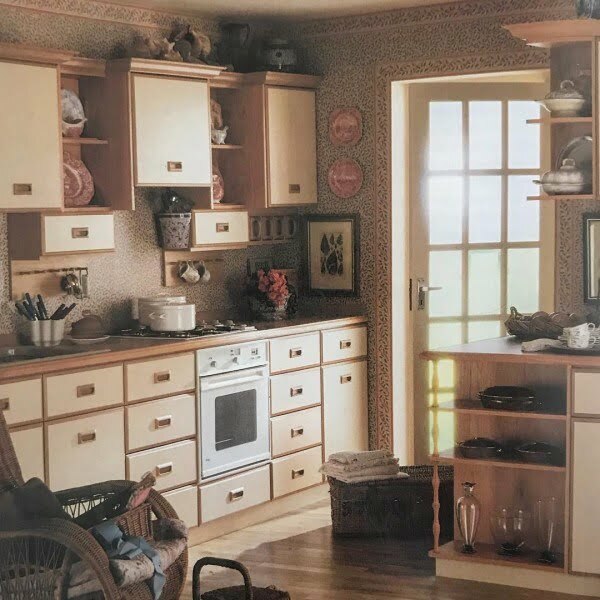 The explosion of colors across the full “retro palette” with a little detail in the kitchen cupboards add so much life without going overboard. The exposed brick wall is a nice touch too. 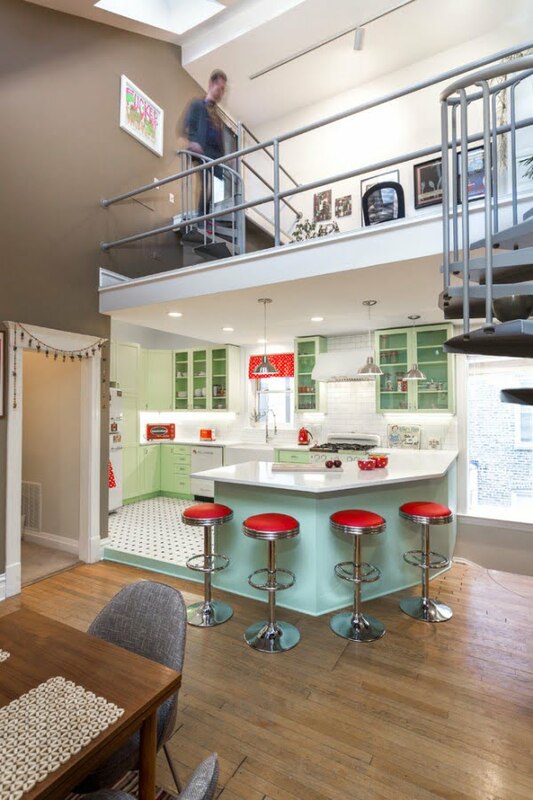 Pastel green and popping red and yellow dishware set the retro mood, while rounded furniture and kitchen stove corners bring it together. 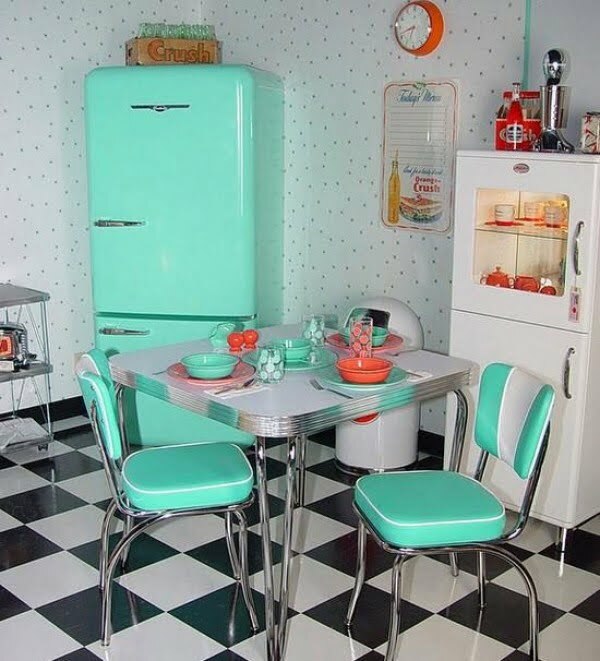 Checkered floor, an awesome retro design fridge, bright teal colors, and wallpapers take you 60 years back. This mix of modern and retro style is rather intriguing. 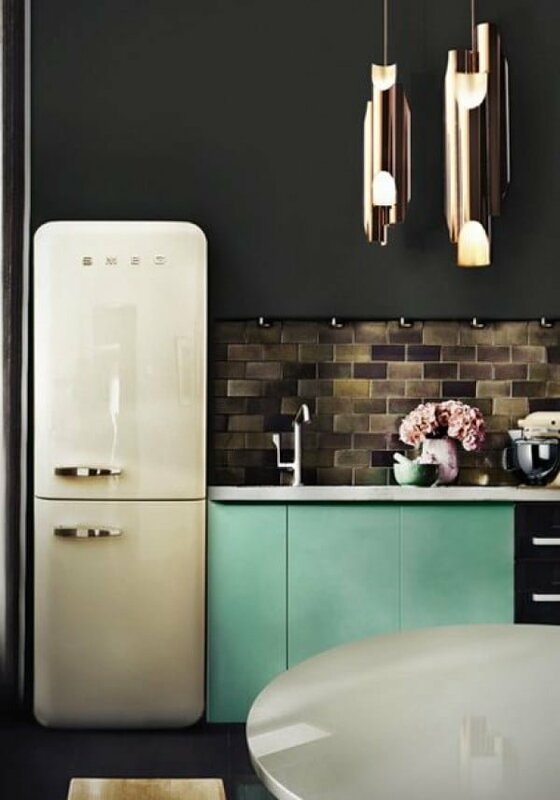 We have soft pastel and dominant black colors, rounded edges and art deco chandelier. An unlikely combination that works wonderfully. 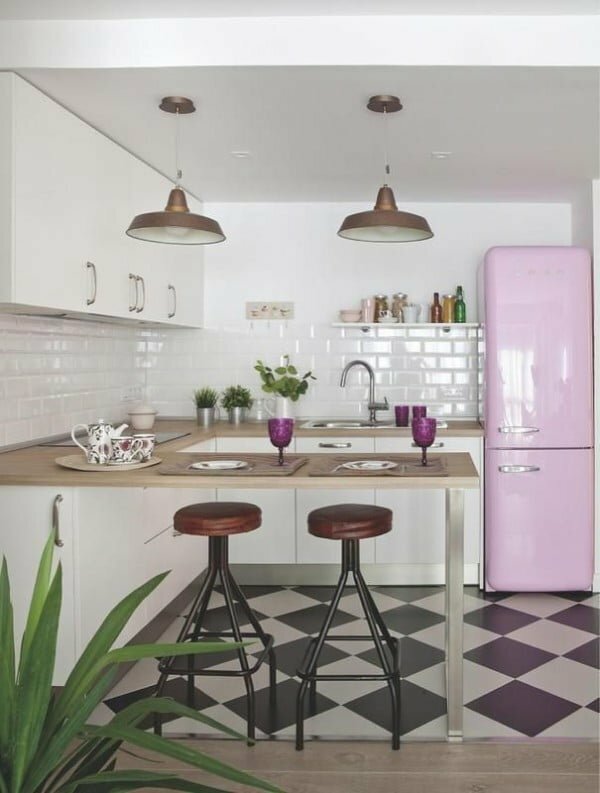 Retro inspired by fridge design in pink pastel, checkered floor, and glossy brick backsplash. It’s a unique combination but a winning one. 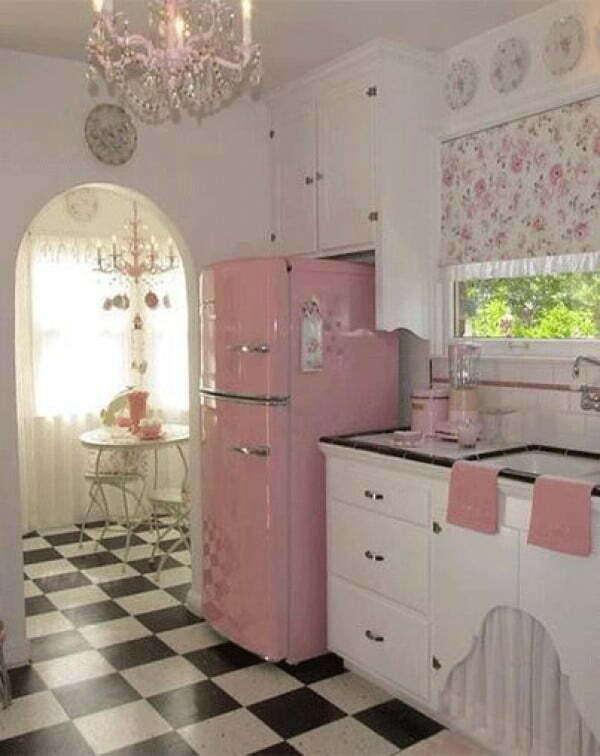 Pink is very feminine, and this retro design is very luxurious with glossy furniture, crystal chandeliers, china wall decor, and yet we don’t lose the checkered floor. 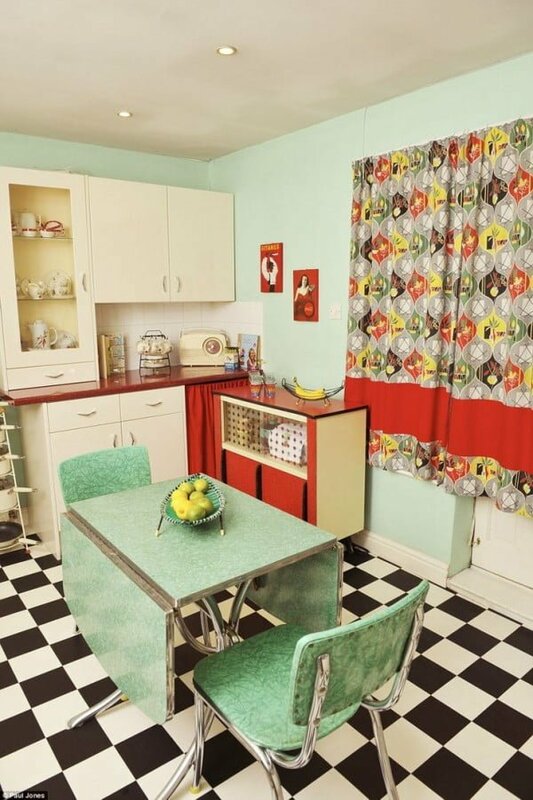 Introducing vibrant patterns with the curtains which let the explosion of red and pastel green possible in this retro kitchen. 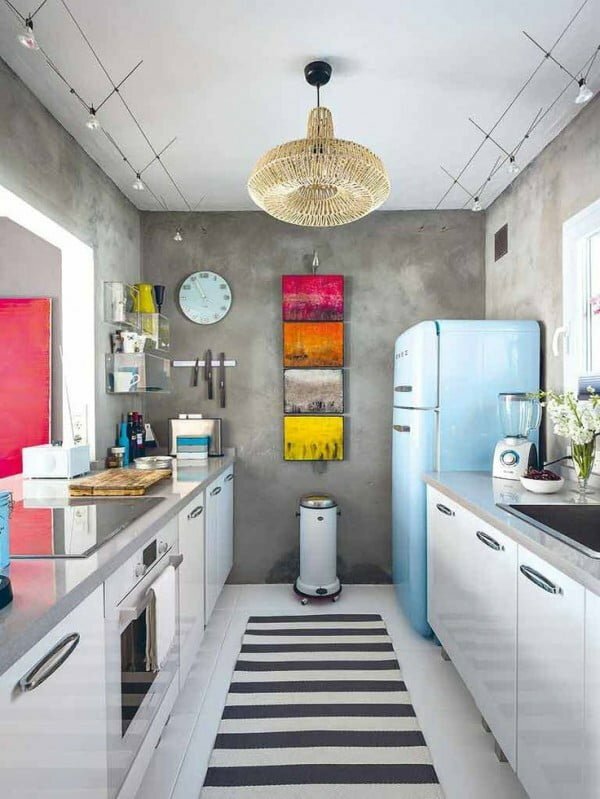 Industrial meets retro with exposed concrete walls and the variety of color while keeping modern kitchen furniture but making an accent with a retro style fridge. 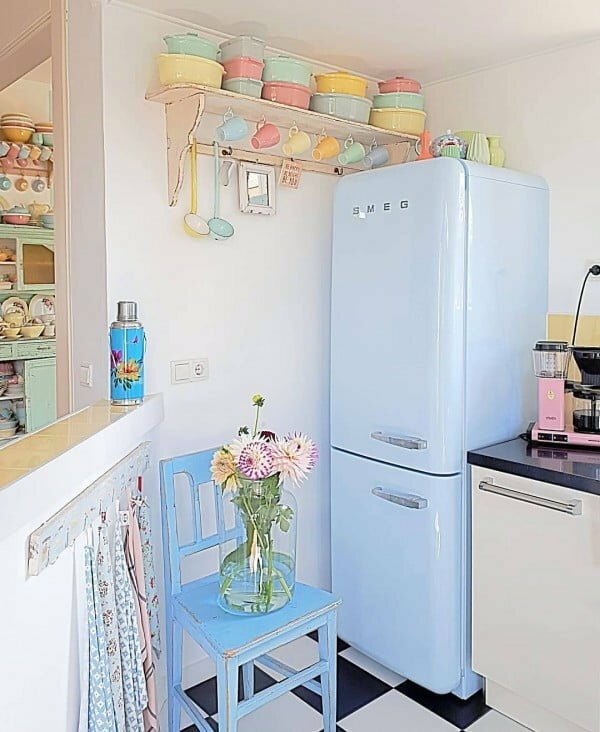 Lovely play of pastel colors and retro style appliances in this small kitchen. 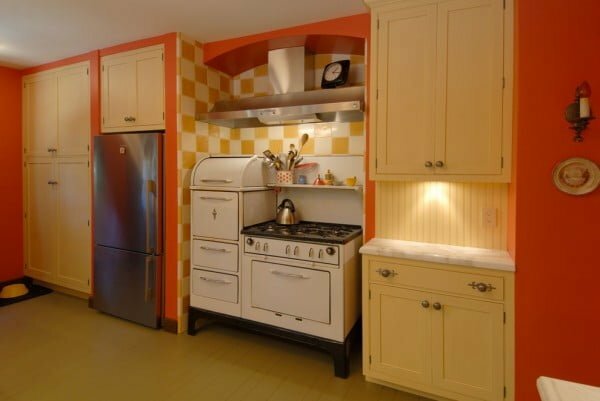 There’s nothing that is non-retro in this kitchen design. 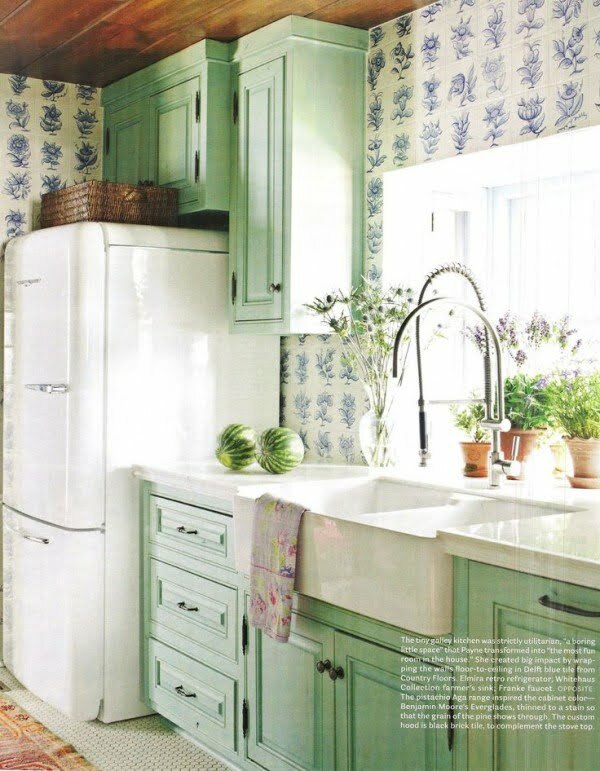 Vintage cabinets in pastel green, big gorgeous retro fridge, floral mosaic wall tiles make this little kitchen very exciting. Leather furniture used to be all the rage. This is a dining area from the 60s with popping blue and white leather furniture.